Make meal time quick, easy, and complete by using our Keto Meal, the world's only MRP made to aid your body in ketone production! Keto Meal is a unique Super Meal. It’s the world’s first and only meal replacement that combines the energy and strength of Ketones + Protein. Imagine a meal replacement that delivers the highest form of energy and helps you burn your own body fat while at the same time provides muscle-building Protein. Best of all Keto Meal doesn’t leave you hungry or craving food a hour later like so many meal replacements do. That’s Keto Meal, the Super Meal. There are a lot of meal replacements being sold in the market place, even some claiming to be “keto friendly” (65% fat, 25% protein, 10% carb). But NONE has actual Ketones + Protein to provide you with a Super Meal. Ketones provide the body with the most powerful energy possible, appetite suppression, cravings suppression, muscle preservation and a feeling of mental clarity. Combine Ketones with body building Protein and you get a Super Meal. It is the first and only Complete Meal Replacement that combines the powerful energy of Ketones with the building blocks of high grade Protein that delivers long lasting energy, no hunger, no cravings plus all the other benefits of Ketones and muscle building Protein. Keto Meal is another Real Ketones product that supports CKS (Continuous Ketone Supplementation) when you are trying to sustain your beneficial Ketone levels throughout your day. Just tear open the packet or take two scoops from your Keto Meal tub and you have a complete ketogenic meal in seconds. Keto Meal is convenient, tasty, and most of all healthy and satisfying. Compare any other meal replacement to Keto Meal. You won’t find the power of actual Ketones + Protein in any of them. Give Keto Meal a try today and experience what a Super Meal really feels like! Why was Keto Meal developed? The creators of Kegenix PRIME and CKS (Continuous Ketone Supplementation) believe that you should be able to add the benefits of Ketones to your current lifestyle regardless of your present diet. Kegenix PRIME was their first product to provide true Ketone supplementation to help your body sustain its beneficial ketone levels for consistent mitochondrial energy production. PRIME provided everyone an easy way to obtain the benefits of Ketones while paving an easy road to further reducing their dietary level of damaging carbs. Keto Meal was invented to add another great tool to support CKS by providing a daily option to conveniently get a complete ketogenic Super Meal in seconds. We used our knowledge and expertise in the development of Kegenix PRIME to engineer a ketogenic Super Meal consisting of Ketones + Protein. There is really nothing else like it and it's now available in two great tasting flavors, natural chocolate, and vanilla. 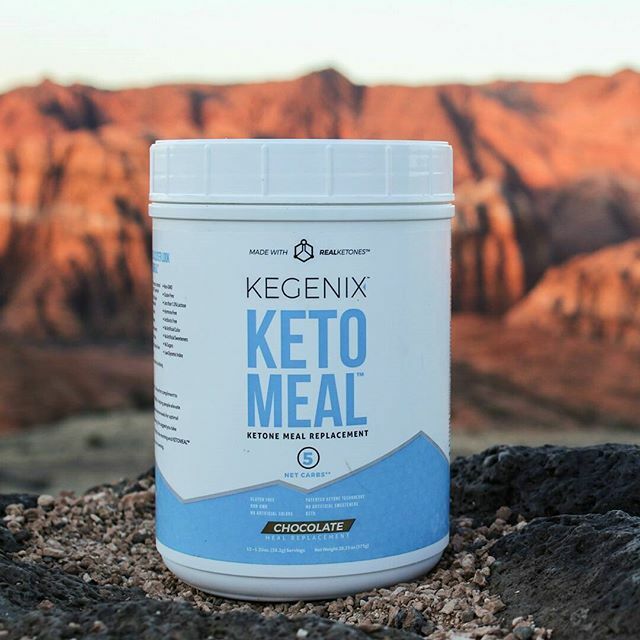 So in addition to Ketones + Protein, Keto Meal contains all the necessary macronutrients, micronutrients, vitamins, electrolytes and minerals for a complete ketogenic meal that comes in a convenient, easy to mix powder. It also contains our multi-patented Ketone formula that integrates Acacia fiber/MCT, which has been shown to be an effective prebiotic. Keto Meal in addition to being a Super Meal helps to reduce glucose levels, improve gut health, and promote appetite suppression and weight loss. How KEGENIX works to keep you in ketosis. 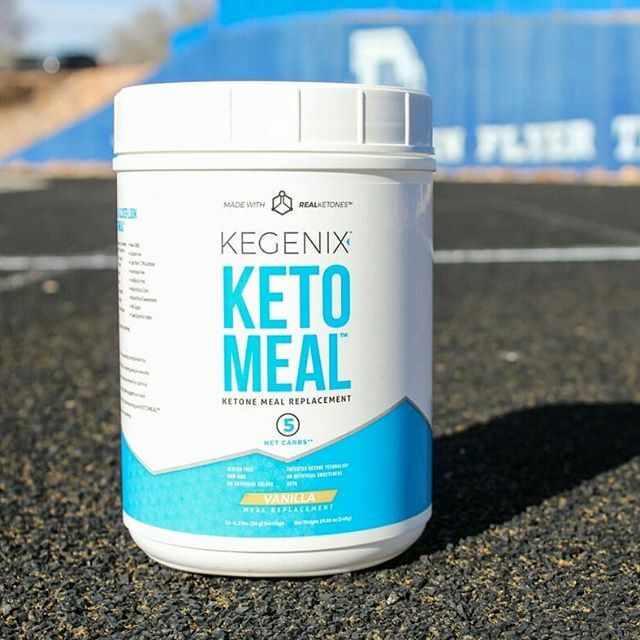 Keto Meal Replacement is the perfect complement to Kegenix PRIME ketosis powder in helping to elevate and sustain ketone levels for optimal health and energy. We suggest you take Kegenix PRIME ketosis powder in the morning and Keto Meal replacement in the afternoon. Make your favorite drinks keto with KETO MEAL! Check out some recipes below! Click here to order Keto Meal while supplies last!